The Faculty Director for the program, Professor Decker, will meet students in Germany and will oversee their coursework, lead cultural activities in and around Münster, and provide students with academic and cultural support. Students will live in student apartments within walking distance of the language school, KAPITO Sprachshüle, where German classes will be held five days a week. Small classes with hands-on instructors will help students improve their language skills while a range of cultural activities and excursions in the afternoons/evenings and on the weekends will give students a chance to sample different aspects of German culture and reflect on their experiences in Germany with their fellow students and with Professor Decker. Students outside of Rollins are able to apply for this opportunity! To find out more, click here and scroll down to the "students from other institutions tab." There is no group flight for this program. Students are encouraged to make flight arrangements to Frankfurt where they will meet with Professor Decker and other program participants to travel together to Münster. IP will provide students with specific arrival details so students may book their flights accordingly. Upon arrival on Saturday, students will be provided transportation from the Münster train station to the student apartments. Students will have time to settle in and will then proceed to a welcome dinner later that evening. 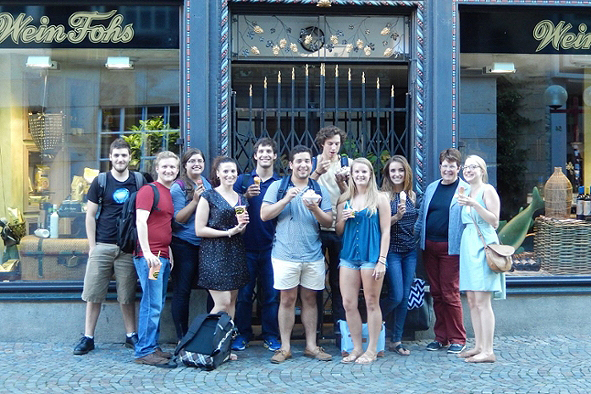 On Sunday, students will meet with Professor Decker to enjoy a walking tour of Münster and a group lunch. On Monday, students will be introduced to KAPITO and will take a placement exam. Intensive German classes will start on Monday or Tuesday. All students on the program will enroll in one four-credit German course at our partner, KAPITO Language School. KAPITO has been offering quality German language programs in Münster for more than twenty years. Classes at KAPITO are small, usually no more than ten to twelve students, and instructors are all native speakers who have extensive training and experience in providing intensive language teaching. The instruction at KAPITO focuses on student engagement and emphasizes communication skills—instructors aim to get to know their students outside the classroom as well as in it and often participate in the cultural activities and excursions that KAPITO offers to enhance classroom learning. Each small group of students is taught by two instructors, and from the very first lesson, the teaching language is German. On the first Monday, students will take a placement test at KAPITO to assess language level for courses. KAPITO offers various learning levels which correspond to levels A1 - C2 of the Common European Framework of Reference for Languages. Due to the intensive nature of the program, students will only take one 4-credit course over the four weeks—this will include 26 45-minute course sessions per week, with the majority of those being held in the mornings to allow time for cultural activities in the afternoon. KAPITO is located in the Münster city center and has fourteen classrooms as well as self-study rooms with textbooks and computers with Internet access. KAPITO staff are available to provide learning support and homework supervision during the afternoons. Professor Decker will also be available to assist students with academic concerns. GMN1XX: this course is pending approval but will be appropriate for students who have completed German 101 or the equivalent. Students will receive four credits upon successful completion of the program. The course will appear on the Rollins transcript as a normal Rollins course with a standard letter grade. Nancy Decker is an Associate Professor of German at Rollins College and is the current chair of Modern Languages. Dr. Decker received her bachelor's degree from the College of William and Mary  and did her graduate work at Cornell University [M. A.1981, Ph. D. 1983]. At Rollins she teaches courses dealing with many aspects of German language, literature, film, culture, and business practices. She has led short-term field studies to Germany multiple times, most recently in the winter of 2011 and the winter of 2013. She has also worked closely with IP to restructure semester programs in Germany and established the original relationship with KAPITO several years ago. Professor Decker, will serve as the Instructor of Record for all courses and will provide ongoing academic oversight as well as issuing the final course grades. In Münster, students will live in furnished apartments with native German speakers. Common areas and kitchens are shared and all students typically assist with chores in the apartment. Most students will have their own bedroom. There is internet access at KAPITO, but it is not guaranteed in the student apartments. Students may cook meals in their apartment or go out to eat. Grocery shopping can be done at the open-air market on Domplatz or at a variety of grocery stores in Münster. Students may also choose to eat meals at the University of Münster cafeterias, which are particularly inexpensive. Please note that the estimate for meal costs assumes that students are purchasing groceries and preparing about half their meals. Group Meals: Professor Decker will arrange two group meals per week—generally lunches or dinners. The schedule for these meals will be determined after students have been placed into courses. Some of the group meals may be integrated with cultural activities. KAPITO arranges five cultural and/or social activities per week. These activities may include cycle tours, film shows, excursions, museum visits, visit to a moated castle near Münster, pub tours, and sporting events. There will be one full day excursion on one of the two middle weekends to Cologne, Dusseldorf, Essen, Oberhausen, Aachen, Bremen or Hamburg. A guided tour of the city and a museum visit will normally be included. Professor Decker will also lead cultural activities each week, some of which may be integrated with the KAPITO events. Students are encouraged to travel independently on the one free weekend during the program. From Münster students can travel easily by train or plane to many locations in Germany and/or nearby locations in Europe. Münster is located in the federal state of North Rhine-Westphalia. It is the cultural center of Westphalia and a significant center for business and administration. Although the city was destroyed in World War II, the historic center of the city was fully restored. The colorful bustle of the market in front of Münster’s Roman gothic cathedral, which lies in the middle of the oldest part of town, attracts crowds several times a week. The most popular mode of transportation in Münster is the bicycle! A wide net of bicycle paths makes it possible for cyclists to make outings to the green surroundings of the city. In and around Münster, there are also many castles, which were once inhabited by nobility and are now open to visitors. Rollins students in Münster typically walk to/from classes and activities, though there are is also public transportation available (buses and trains). tuition, program administration, housing, orientation program during the first weekend, four-six cultural activities per week, one day-trip to a nearby German city, two group meals per week, and comprehensive health and emergency insurance.